Day 1: Trujillo, City Tour, Caballos de Paso, Huacas del sol y la Luna. 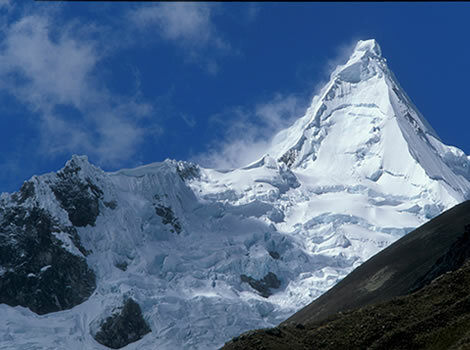 Arrive in Trujillo and transfer to your hotel. From your hotel our guide will walk or drive (depending on the location) you to â€œLa Plazoleta de Recreo (recreation square) and further up to the Monestery of Pinacoteca del Carmen. Afterwards you will visit the salons from Club Central, followed by a visit to â€œCasa Haya de la Torreâ€, museum about and birthplace of VÃ­ctor RaÃºl Haya de la Torre, the Trujillan founder of the Aprista Party. Around 11:30 am your will bring a visit to the Santo Domingo Church, from where you walk to Plaza de Armas and the Cathedral, on your way to the well-known Casona Deza, for a coffee or tea. At 13:30 h you will be treated with a very traditional show from the specially bred and trained Peruvian â€œCaballos de Pasoâ€ and Marineras. 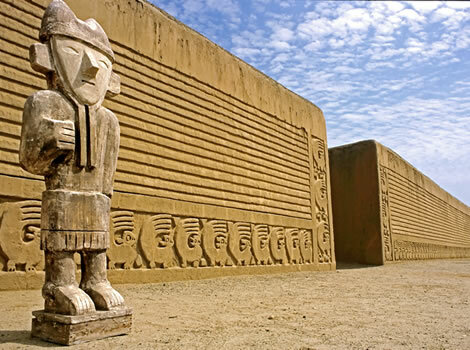 In the afternoon you will visit the archeological site of Las Huacas del Sol y la Luna, gigantic temples from the Moche culture (100-700 AC). Several structures on this site are still decorated with well conserved paintings on the walls. 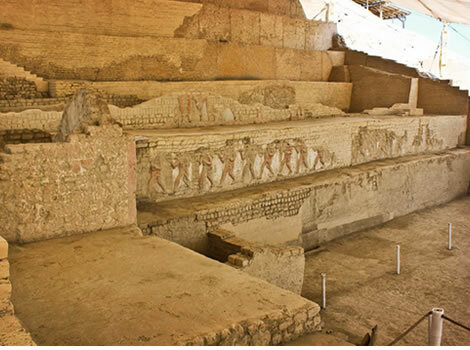 Many beautiful decorated golden and ceramic objects found on this archeological site can be seen in the site museum. 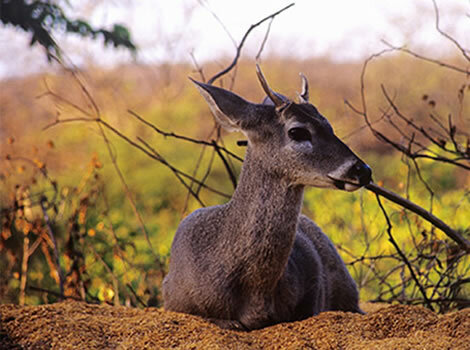 This exclusive tour offers an interactive experience, during which you learn more about the gastronomical specialties of Trujillo and surroundings. We start with visiting the busy and well-known local market of Hermelinda, to see with your own eyes where even some of the best cooks from Trujillo find their special and fresh ingredients. 11:00 am - After learning how to make an original Pisco Sour Trujillano, we visit the local fishermanâ€™s and tourist town of Huanchaco. Believe it or not, but each morning, just before sunrise, there are still several local fisherman who climb on their traditional â€œCaballito de Totoraâ€ (â€œHorses of Reedâ€, small one person boats, made of reed) and paddle with a piece of caÃ±a de bamboo into the open sea to catch their fish. 13: 00 h - Knowing that our fish is fresh, it is time to learn how to make a special ceviche norteÃ±o and, of course, to taste it. No matter the delicious taste of our own fresh ceviche, each real Peruvian loves their sweet desserts, so a gastronomical tour is not complete without a Peruvian â€œpostreâ€. For this bite of sweet we visit the famous DoÃ±a Carmen. 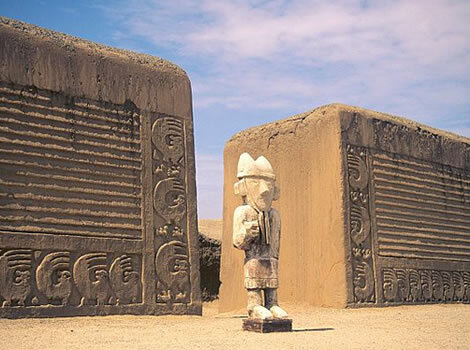 In the morning you bring a visit to Chan Chan, capital of the Chimu culture between 900 AD until the Incaâ€™s arrived around1470 AD. The most impressive structures on this site include: Huaca Arco Iris and Palacio Nik-An with different nature, bird and fish motives. This archeological site used to be a sacred place for several cultures including the Moches, Waris, Incaâ€™s and even until colonial times. From the adobe pyramid/ temple it is believed that the Moches used it to practiced sacrifices. The walls are build with Moche architecture and impressive iconography. 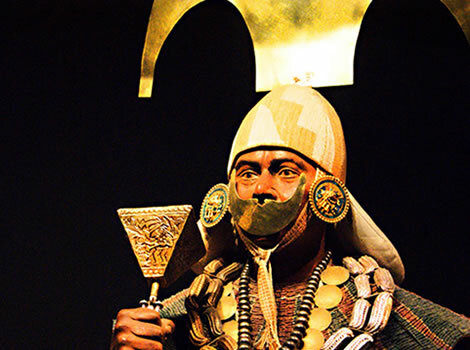 The very well-constructed and organized site museum shows objects that remain of the cultures that lived here and also the remains of SeÃ±ora de Cao. 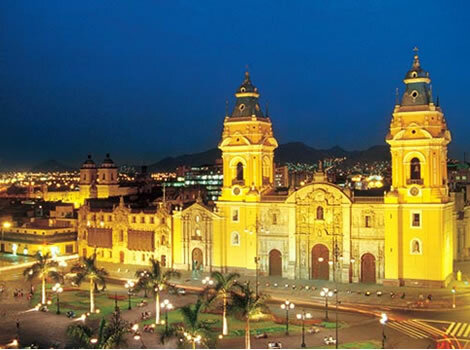 After the tour you will be transferred back to your hotel and the airport or bus terminal of Trujillo.